Salt grill & Sky bar located at level 55 of Ion Orchard Mall is a modern Australian restaurant helmed by Executive Chef Jake Kowalewski. My last visit was during Ion workshop campaign 4 years ago. Time flies! With more than 10 years of culinary experience, Chef Jake has recently taken over the reins from Chef- Restaurateur Luke Mangan. So, I am quite excited to try out the dishes curated by Chef Jake. With the festive season around the corner, I am here to check out their 5-course Christmas Dinner Menu priced at S$148.00++ per pax. This exclusive menu is only available on 24 & 25 December 2018. 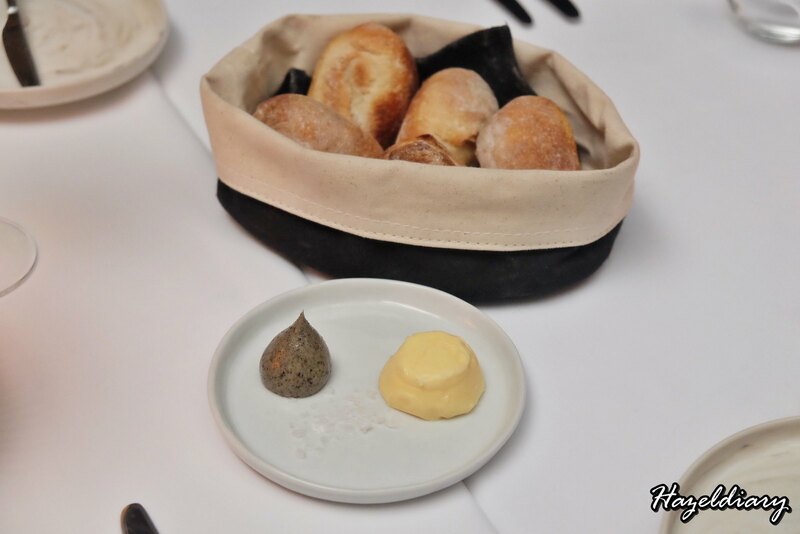 Complimentary bread basket before the dishes is served up. 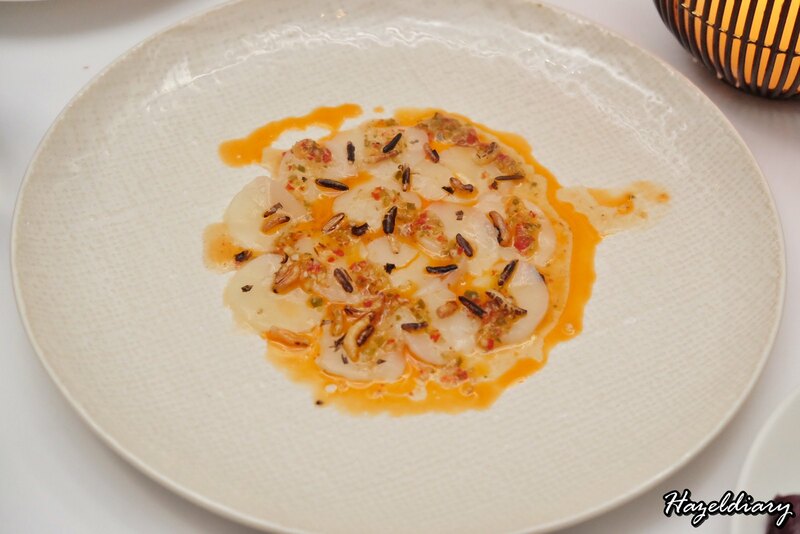 We had the Hokkaido scallop with nam jin, crustacean oil and puffed rice. The combination of sweet flavour scallop with salty, sweet, sour and orangey oil sauce has the Asian flavour twist in it. 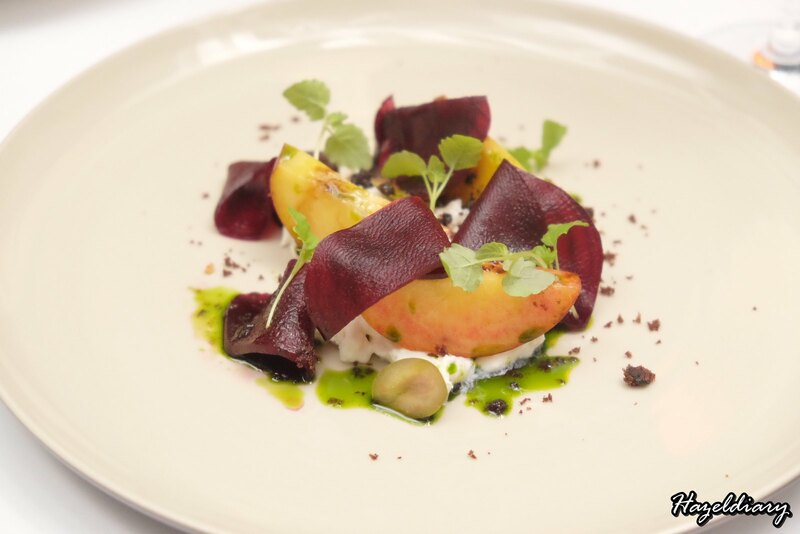 Next, Stracciatella cheese paired with peach, pickled beetroot slices and complete with olive and smoked olive oil. The cheese boasts a richly sweet, soft and silky texture while the peach gives a sweetness note to the dish. 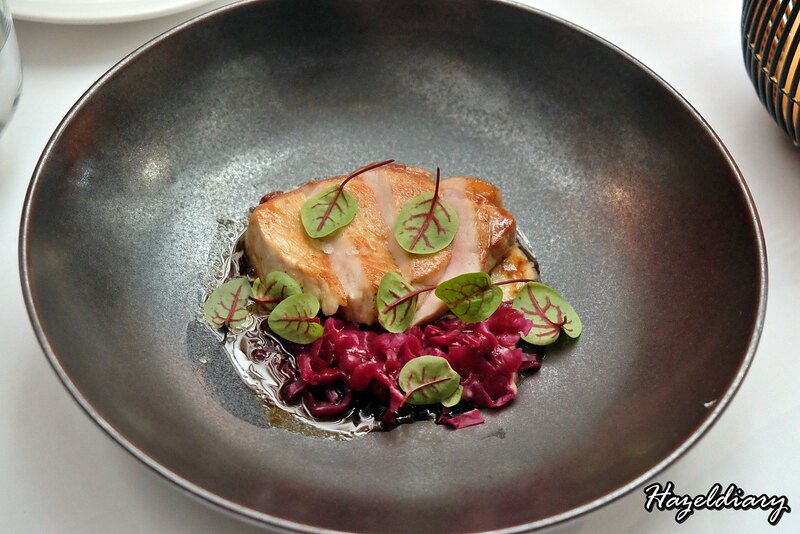 The third dish is the Bangalow pork served with apple & ginger puree,fermented cabbage and verjuice glaze. It has the Christmas elements in it especially the curated puree. Also, Chef sources the pork from Bangalow, Australia, which is hormone and antibiotic free and one of the best quality in the country. P/S: Photo is the tasting portion for 4 of us. Thus, this is not the actual portion for this dish from this photo. The last savoury dish is everyone’s favourite that night. 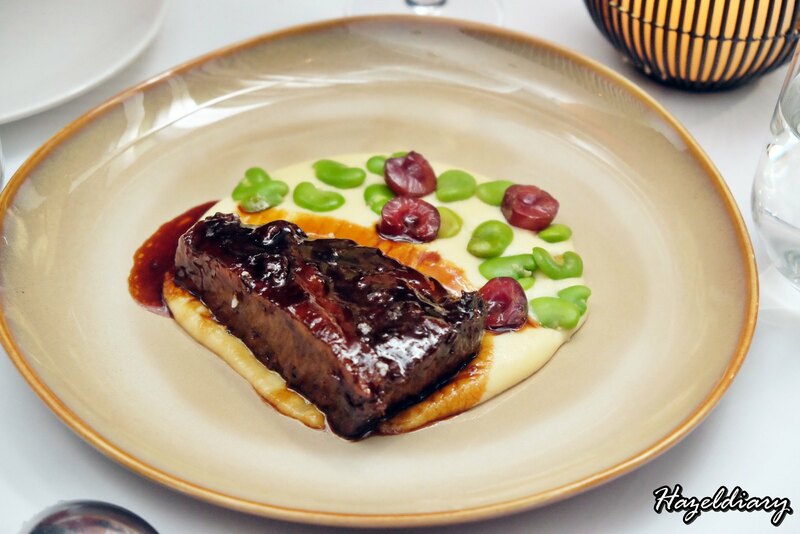 Whiskey glazed wagyu short rib served with smoked potato, broad bean, pickled cherry. The presentation colour of the dish is quite appealing and it reminds me of chendol colours. The texture of short rib is into fork-tender meat and the intense flavours after 48 hours of cooking. Umami! Lasly, we ended the night with textures of chocolate, salted coffee and mascarpone dessert. Rich, creamy flavours I would say! There is popping candies too! 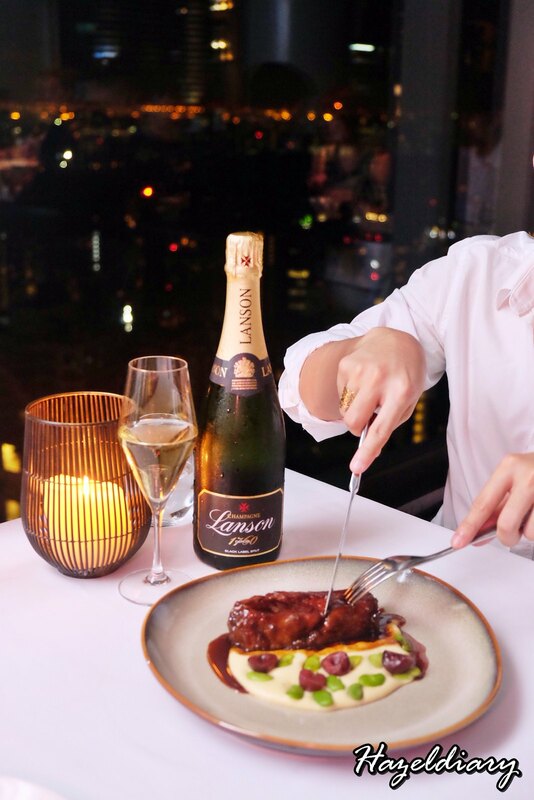 Complete your dining experience with Lanson Brut Black Label Champagne at S$88.00++ per bottle (Original price outside of festive season : S$128.00++).